One of the best things about living in Paris is the supply of macarons. 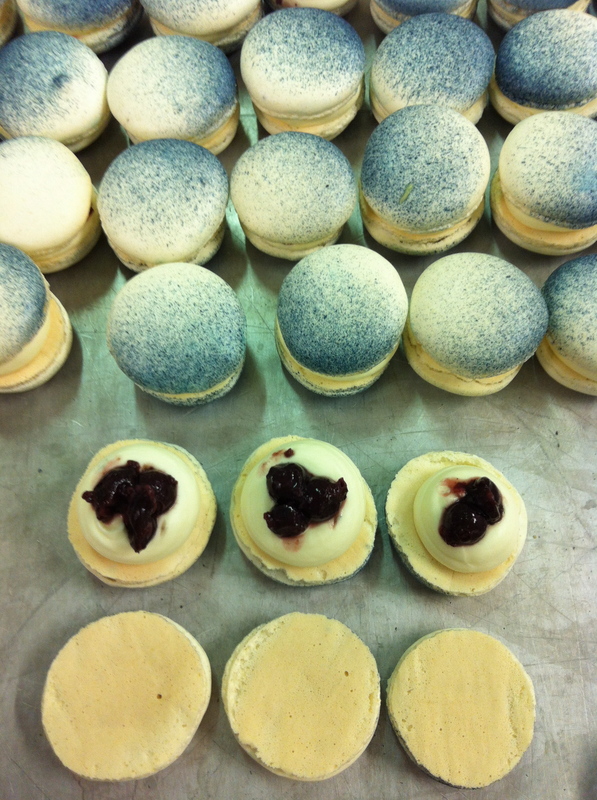 These perfect little round meringue sandwiches have officially solved my gift idea worries. Expect macarons for your birthday. 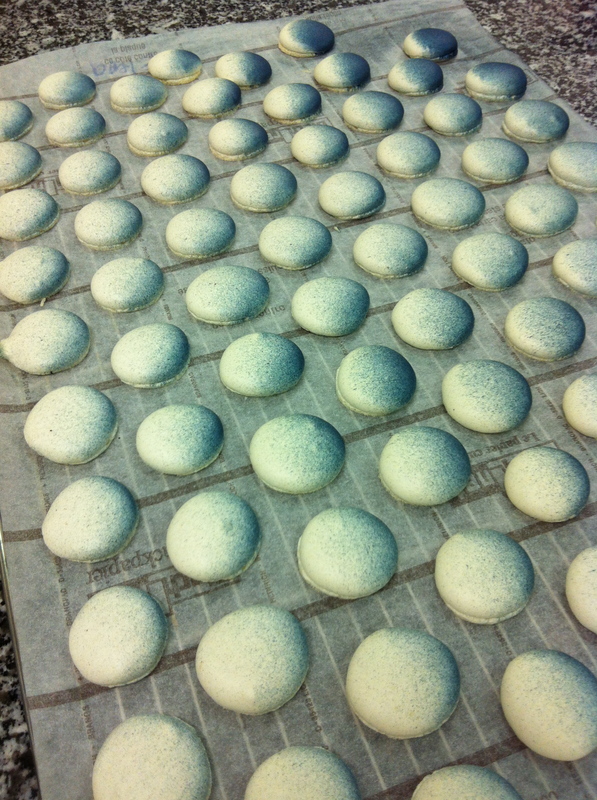 And, if you’re not a fan of the macaron you can’t deny the world has gone crazy for them. There are literally hundreds if not thousands of people by day, in Paris, who go chasing for macarons. 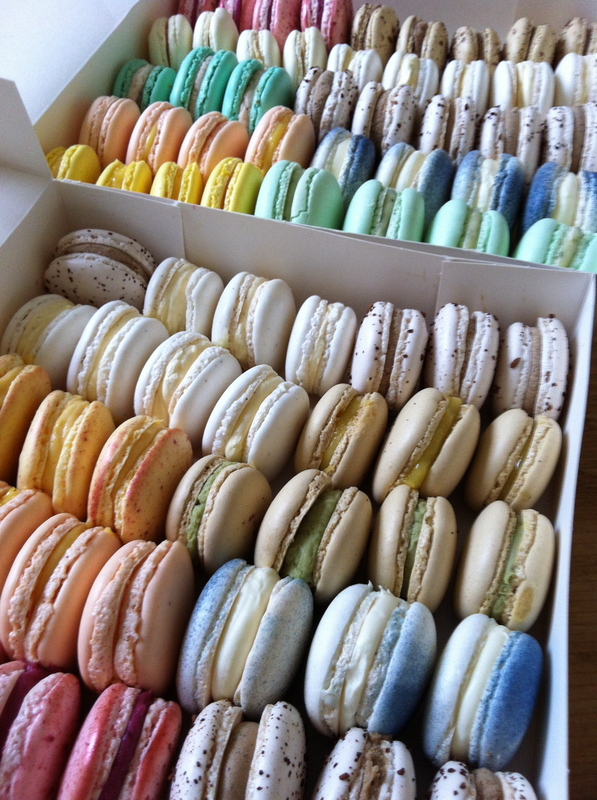 For some, it’s merely to discover the famous French macaron. For others, it’s a more serious chase. There are those who take on the responsibility in naming ‘the best macaron’ in Paris. This requires dedication and effort. Sometimes it’s an individual effort but if the city’s supply of macarons is too much for one then an unofficial panel of “judges” is called in. The judges will taste test all the flavour combinations, judge the texture and shape and compare quality to price. Then, announce the Winner. Those judges can be you or me. 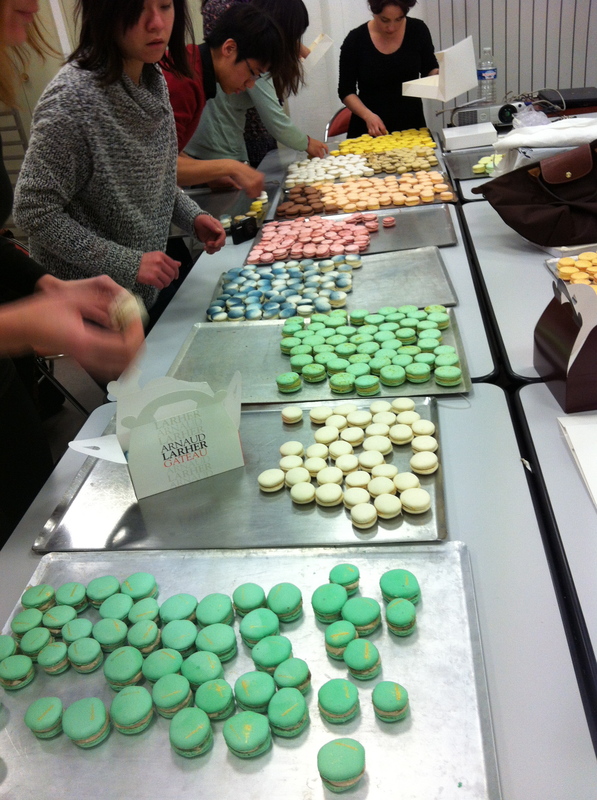 So, naturally, when the day finally came to making the famous macaron in the lab (at school), the class was excited, anxious and very much anticipating the results. 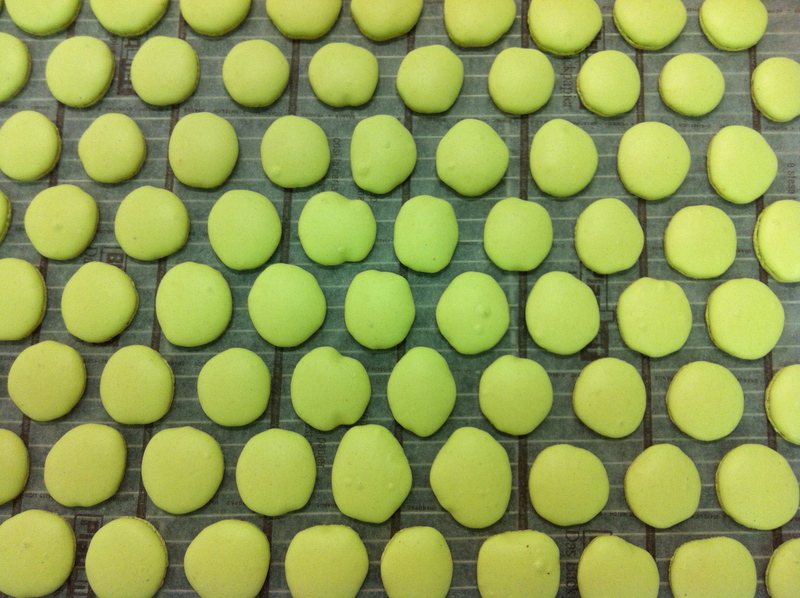 Will our macarons make the top 10 list? To make the macarons we began with a very crafty cardboard. 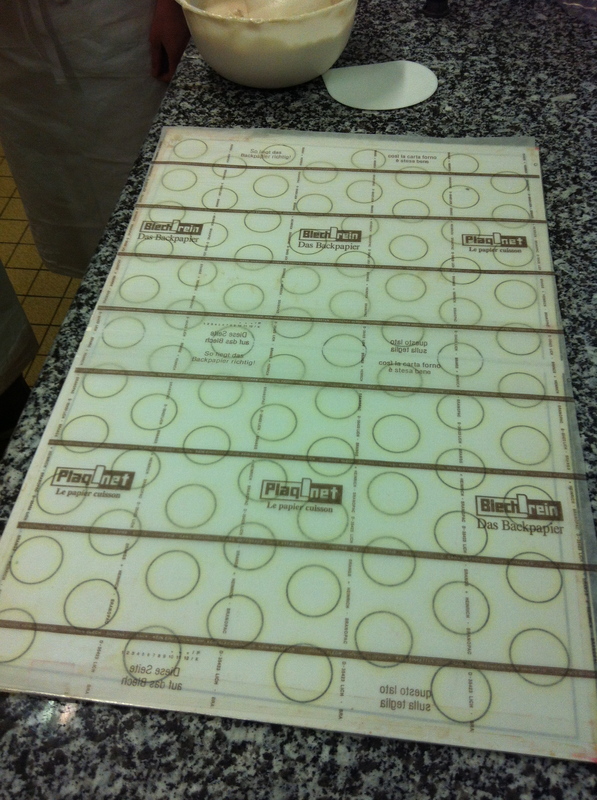 On it are rows of circles and over this we put a transparent baking paper. 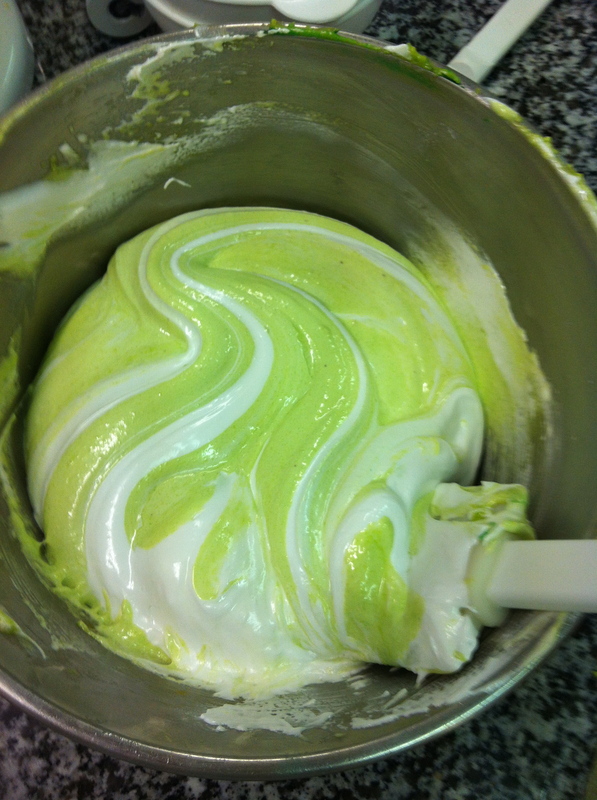 For the macaron shells, we first make an Italian meringue mixture in a KitchenAid. When the meringue mixture is ready we transfer this to a plastic piping bag attaching a tip No.10. 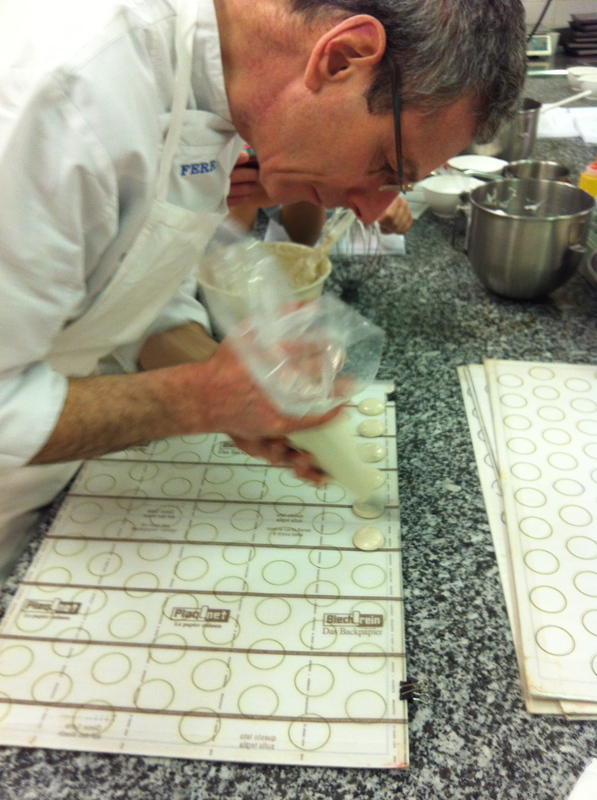 We then direct the tip towards the center of each circle and pipe an even dollop of meringue mixture but stopping just before the circle line. 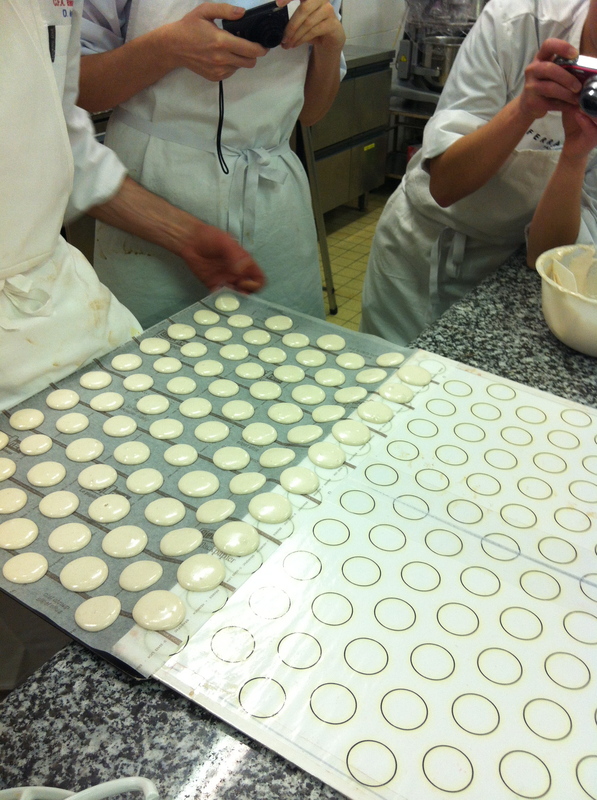 When the tray is full we rest it at room temperature so that the meringue can develope ‘a skin’, and only then do we bake. After removing the tray from the oven it’s necessary to cool down the shells. 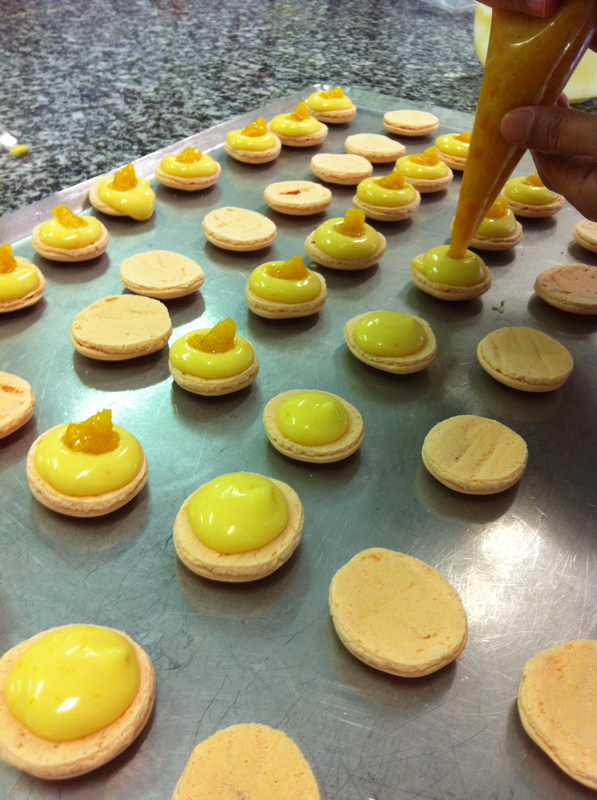 Once the shells are cool we pipe our desired filling (ganache, confiture) with a tip No.6. Sandwich the filling with two shells, and voila, a Macaron. Easy enough, noh? Apparently not. At least not for me. In my defense, it was my first time. 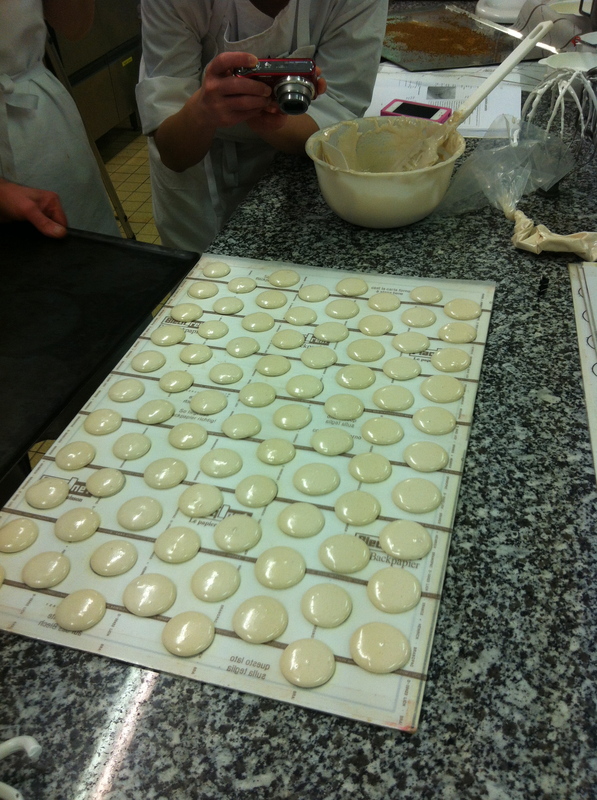 After a 5 minute clean-up I resumed working, squeezing dollops of meringue this time targeting only my meringue circles. As I regained my groove, I worked faster and more confidently, piping row by row without a hiccup. 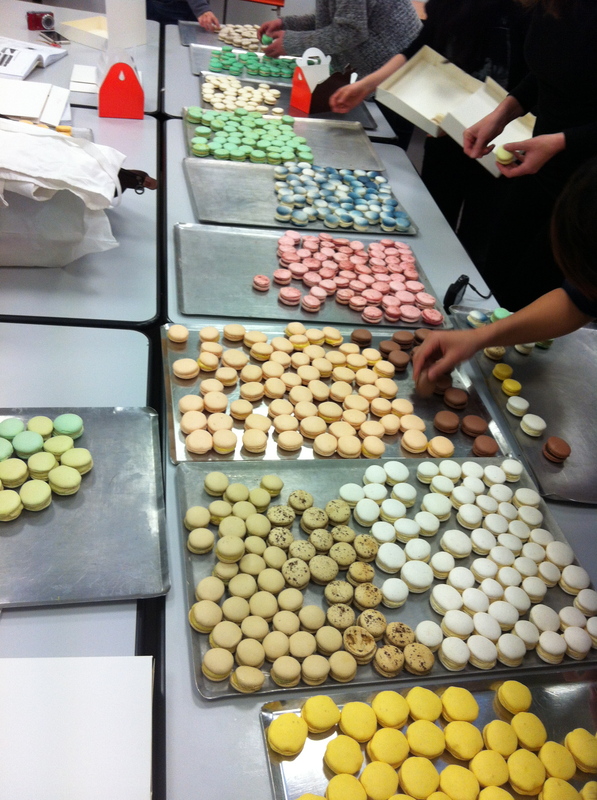 “I might just be Paris’ first Madame of Macarons after all”, the thought appeared with my sudden boost of confidence. My nose almost to the workbench I decided to step back to see my work. What? What’s this? As I stood-up straight and a foot away from my board I was surprised to see not perfect rounds of meringue but green slimy goo making its slow descent down the wall of cardboard. 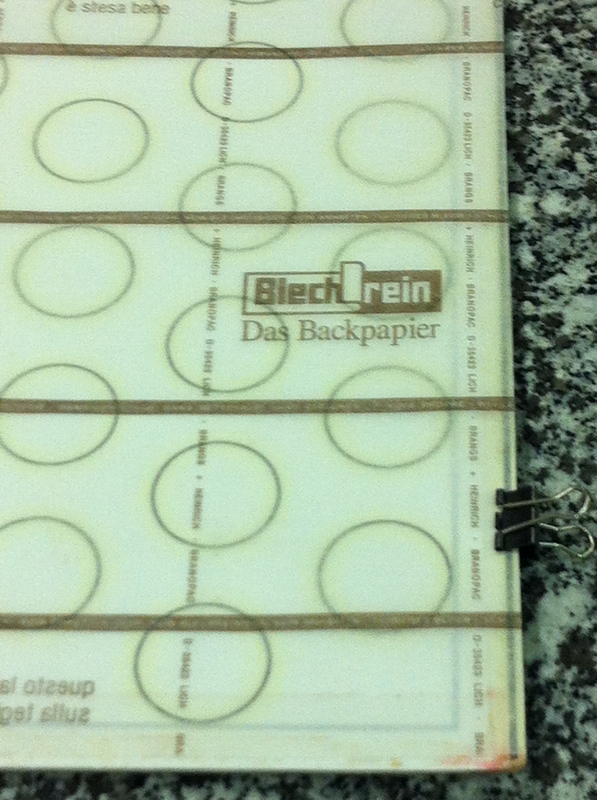 Immediately, I thought of Ghostbusters. You should have seen Chef’s face when I brought him my tray of Ghostbusters goo. Usually he makes a remark – if he thinks your work is not good he’ll say either, “What’s this! ?” or “This is, Whatever”. This time he was silent, he couldn’t find the words for my green goo. When my tray finally came out of the oven I became the proud owner of Ghostbuster macaron shells. My shells were green because I was given the flavour, Olive Oil. Yes, folks, Olive Oil. 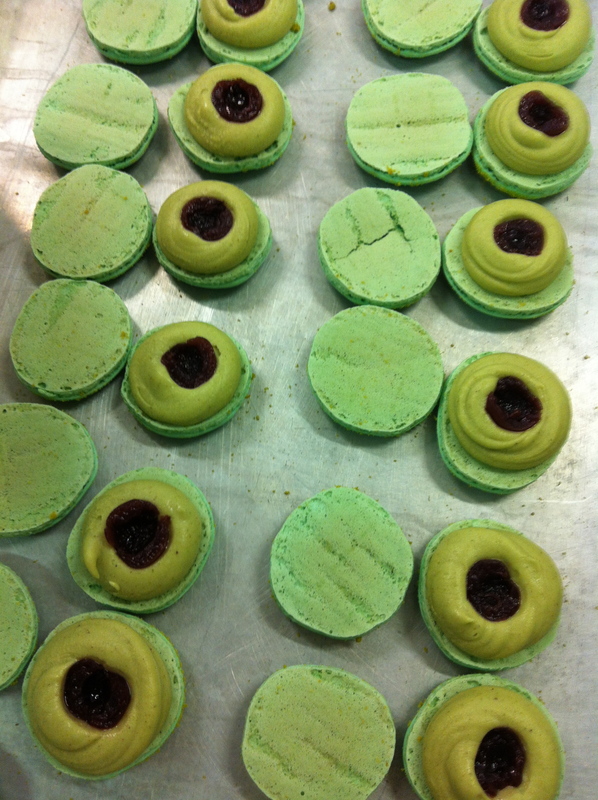 Now, if I hadn’t already tasted Pierre Herme’s Olive Oil macaron I would squirm too, it’s actually very tasty. 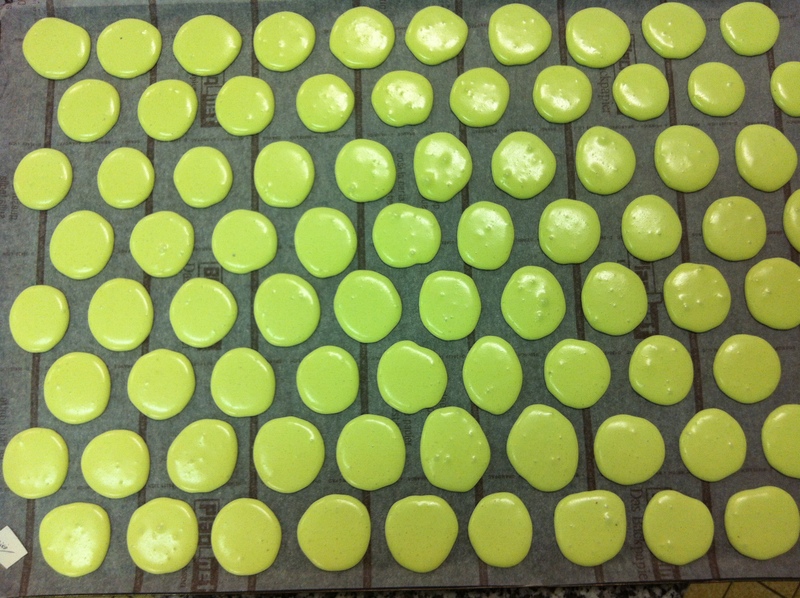 How were my Olive Oil Macarons? Not good at all. I found the Olive Oil dominating and as a result I lost any hint of vanilla flavour, because in fact the recipe is, Olive Oil and Vanilla macarons. Tant pis pour moi. So for now my macarons will stay off the ‘best of’ list, but perhaps they have a chance to find their way into a candy bag . When is Halloween? Food colour, drop by drop to your desired colour. Be careful! Olive Oil, 180g, I found this was too much. “The judge is the oven”. This quote was in reply to a student’s question regarding baking results of the macaron shells. The oven will determine if you prepared your mixture well or not. Always take care and faites attention to your preparation. Wow! 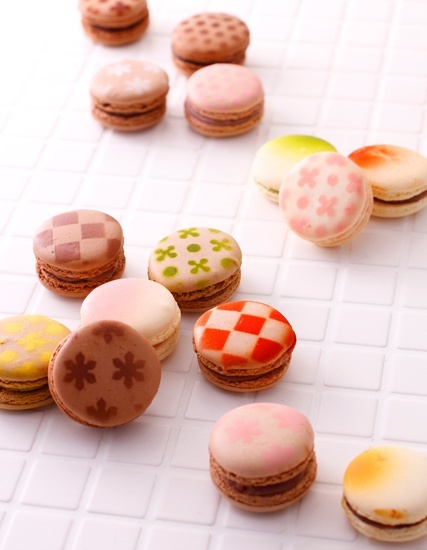 I never thought of using 2 fillings for the small macarons!